Last month, just as Kernos was in the process of celebrating the 14th anniversary of the opening of its counselling centre in Sudbury – offering support for local people with emotional and psychological difficulties – Prince Harry was speaking out about the importance of recognising, being aware of, and dealing with mental health issues. Everyone involved with Kernos – clients, therapists and staff – acknowledges how inspiring, and courageous, it was for Prince Harry to talk publically about his mental health; his comments also come at a time when research shows that, although chronic depression is more than three times higher amongst women than men, it is the latter who are three times more likely to commit suicide. Kernos’s own figures bear out the research that shows seeking help for mental health issues is difficult for men – of over 2,800 local referrals for counselling support the charity has received in its 14 years in Sudbury, only just over a third were for men. It must be hoped that Prince Harry’s example of talking candidly about his experience will encourage more men to do the same – and seek help. 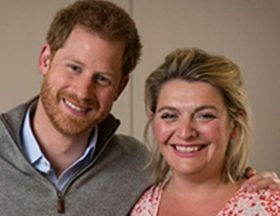 In his interview with the Daily Telegraph’s Bryony Gordon on her Mad World podcast, Prince Harry endorses the need for mental health support for everyone, young and old. Bryony Gordon’s Mad World podcast interview with Prince Harry can be heard here.